It's Monday, so it's Chart Mondays again! James Arthur is reigning supreme at number one on the UK Singles Chart with "Say You Won't Let Go", which opens the top 10 for my review. Luckily, Bruno Mars has jumped to number nine so I have a music video to review. Bruno Mars acts full of confidence, strutting around with his dancers in "24K Magic" music video. Classy, fun and slightly arrogant, what happened to Bruno Mars? Bruno Mars, real name Peter Hernandez, is definitely one of the biggest male artists around at the moment. His lengthy career has really proven that he is a force to be reckoned with in the music industry. He has so many hit songs behind his name, he literally has earned his spot internationally. This song is pronounced twenty-four karat magic. The song is retro, definitely bringing the incredible disco of the 80's and turning it into a 21st century song. No one can do such a thing apart from Bruno Mars, and he definitely pulls it off in the song. Perhaps not the video though. The song was written by Bruno Mars, Christopher Brody Brown and Philip Lawrence. Directed by Bruno Mars and Cameron Duddy, it was filmed in Las Vegas at The Bellagio Las Vegas Hotel and Casino. 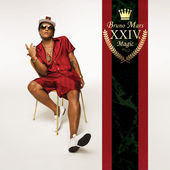 Scenes includes a Bruno Mars party as well as him riding in a black Cadillac Allanté. Whilst Bruno Mars rides on a jet ski, Britney Spears' billboard advertisement for her Las Vegas show can be seen in the background. The entire thing is over-the-top, this is not the way we picture Bruno Mars. It's a total step in the wrong direction from "Uptown Funk", it's like an extremely arrogant sequel to that music video. The dancing is definitely disco 80's. But, unlike the song, there is no 21st century spin on the choreography, instead it looks out of place, as if we have gone back in time. However, it is in time to to the music and everyone is in-sync. The party is definitely hitting it off, but Bruno Mars just doesn't look like he belongs. Personally, I think it's what he is wearing, especially when everyone else fits in. He stands out like a sore thumb, definitely not in a good way. He seems extremely cocky and the video just doesn't work. Overall, the video is relatable, it's just not something we expect from Bruno Mars. The song is upbeat with party vibes, but the choreography doesn't work and Bruno Mars just looks too arrogant for the video.